Two things here: the usage of less and fewer in this context, which Mark Liberman took up here some time ago; and the stereotype of English majors as sticklers for "correct" grammar. … that the now-standard pedantry about less/fewer is in fact one of the many false "rules" that have recently precipitated out of the over-saturated solution of linguistic ignorance where most usage advice is brewed. and pointed our readers to the excellent discussion of the matter in Merriam-Webster's Concise Dictionary of English Usage. As for the English-major stereotype, I'd guess it comes along with the stereotype of ENGLISH TEACHERS as sticklers for correctness. 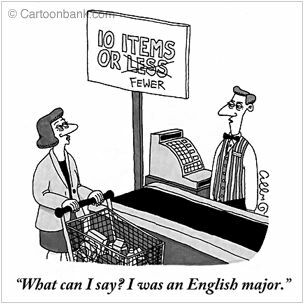 Of course, plenty of English majors are not on a track to being English teachers, and, in my experience, few English majors are pedants about grammar, usage, punctuation, spelling, etc. But then stereotypes are often off the mark.